Free Printable December 2016 Calendar. Free Printable December 2016 Calendar for planning and getting organized this Christmas Season at home, church, business or where you need it. This printable calendar includes previous and next month. Select from two calendar options, starting the week on Monday or Sunday. 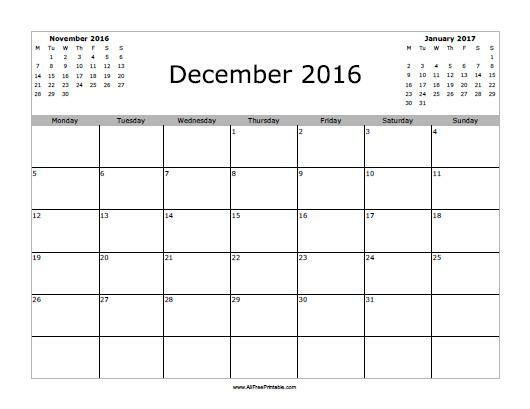 Use the free printable December 2016 calendar to write important days of December 2016 like Christmas activities, family reunion, Gift Shopping, Christmas Vacations, Church Christmas Activity, decoration and cleaning day at home and more. Click the link of your choice to download or print now.